The cucumber (Cucumis sativus) is a common and important vine crop. It is grown largely for its unripe fruits which are used for pickles and to slice for salads. Cucumbers are raised not only in market gardens and on truck farms but also very commonly in the home garden. It has so much in common with other cultivated members of its family, the Cucurbitaceae, that a general statement may be helpful before treating each in detail. The Cucurbits or Vine Crops.--All of the chief economic species of the group of cucurbits, viz., the cucumber, the muskmelon, the watermelon, the citron, the squash, and the pumpkin are tender, tendril-bearing, annual vines, which thrive only in hot weather. In aboveground development and in similarity of root habit they resemble each other very much. Hence, it is not surprising that they are also very similar in cultural requirements. They are long-season crops, transplanted with difficulty when the roots are disturbed, and nearly always grown in widely spaced hills. In the development of the seedling the thick, food-stored cotyledons are pulled out of the ground by the arched hypocotyl. This necessitates care in preventing the formation of a soil crust which would make emergence difficult and also decrease aeration to the vigorously developing roots. A taproot, several inches in length and much branched, is usually formed before the plumule unfolds. This emphasizes the importance to the plant of extensive contact with the water of the soil, food being available for a considerable period from the rather thick cotyledons. The root development, at least of one variety of each of the important species, has been thoroughly studied. Early Development of Cucumber.--Cucumbers of the White Spine variety, one that is best known and most widely grown, were planted June 16. The hills were spaced 5 feet apart. When the plants were well established, they were thinned to 2 or 3 per hill. On July 13, when the first examination was made, the plants averaged 5 inches in height and the total spread was 8 inches. Plants of average development had about 17 leaves, usually 7 of which were fully grown. Since the larger leaf blades had a length and diameter of about 4.5 and 3.5 inches, respectively, the transpiring area already was considerable. The cucumber has a rather thick taproot about 6 millimeters in diameter near the soil surface but tapering to 1 millimeter or slightly less. below 12 inches. It branches widely in the surface 6-inch soil layer, penetrates quite vertically downward, usually with long gentle curves, and reaches depths of 25 to 28 inches. On a typical plant the first 5 inches of taproot gave rise to 11 laterals, 0.5 to 1 millimeter thick, and six smaller ones. These began to appear abundantly about 1 inch below the soil surface. They pursued a generally horizontal although somewhat sinuous course, rarely ending more than 2 to 3 inches above or below their point of origin. The longer ones extended laterally for distances of 18 to 24 inches. One large lateral, which branched at the rate of three to six rootlets per inch, had a maximum spread of 29 inches. Its branches, as was characteristic for other similar roots, varied from 0.1 to 2 inches in length and the longer ones were rather well furnished with short branches (Fig. 81). Fig. 81.--White Spine cucumber root system about 4 weeks old. Aside from the longer main laterals, numerous shorter ones were found, In fact below 6 inches most of the rootlets did not exceed 1.5 inches in length, many were shorter, a few were 6 inches long. All of the roots were more or less horizontal in direction of growth, although quite curved. The shorter ones were entirely unbranched. Frequently the older portions of the laterals were of smaller diameters than the rapidly growing distal portions. The younger roots were delicate and thread-like, the older and larger ones rather tough. Both those of the deeply penetrating taproot and the widely spreading, surface-absorbing system were white in color. The rather meager root development during the middle of July, compared to the extensive roots of many vegetable crops at this time, should be noted. Later the plant makes a remarkably rapid growth. Half -grown Plants.--Two weeks later, July 27, the plants had begun to blossom. The vines were 8 to 13 inches long. The leaves, which were about 4 inches long and only slightly less in diameter, occurred at the rate of 18 to 25 per plant. The taproots were 0.3 inch in diameter and even in the deeper soil maintained a diameter of 1 millimeter or more. Evidently stimulated by moist soil resulting from recent rains, they had given rise to as many as 55 small roots in the surface 1 or 2 inches of soil. These, however, did not exceed 1 inch in length and were only poorly or not at all rebranched. The general root habit differed but little from that of the previous examination; the widely spreading surface laterals and the vertically penetrating taproot being the important features. The taproots now reached depths of 36 to 44 inches. Below 10 inches the branches on the taproots were short. Many of them extended outward only 1 to 2 inches, although a few were 4 inches or even more in length, and with their sublaterals formed a small network. A rate of four rootlets per inch was usual. The occurrence of roots in pairs or small groups was frequently noticed. As the taproot elongated, it became clothed with short branches, except the last 6 to 8 inches which were quite smooth. The horizontally spreading roots in the surface soil had made a marked growth. They had also increased greatly in number (Fig. 82). Usually a taproot had at least 8 large branches arising in the surface 10 inches of soil and intermixed with these 8 to 14 shorter ones per inch. The larger laterals were often 2 millimeters thick and, like the smaller ones, ran quite parallel to the soil surface often to distances of over 3 feet. The longest ended 50 to 55 inches from the taproot and at depths of only 3 to 9 inches. The thick, unbranched, turgid root ends showed that growth was taking place rapidly. The smaller and shorter branches varied from 4 inches to 2.5 feet in length. The usual rate of branching on all of the roots was 4 to 5 per inch, but on some an average of 10 branches per inch was found. The branches were mostly 1 inch or less in length and poorly or not at all rebranched. But not infrequently branches 2 to 4 inches long occurred which were well furnished with laterals. These quite as frequently ran upward toward the soil surface, sometimes ending just beneath it, as horizontally or downward. The main laterals sometimes forked and gave rise to two rather equal branches. Only rarely did a main branch take an obliquely downward course, although a few of the horizontal roots, after growing away from the plant for some distance, turned abruptly downward. These, like a few of the longer main branches from the horizontal laterals, which also ran straight downward, reached depths of 2 feet or more (Fig. 82). Some of these sublaterals from the main branches were 1.5 to 2 feet long and well clothed with branch rootlets. Fig. 82.--Widely spreading root system of cucumber on July 27. The plant is 2 weeks older than thate shown in Fig. 81. All of the roots, whether old or young, had the characteristic taste of the cucumber fruits and, like many other vegetable crops, could be identified by this character alone. Figure 83 shows the roots as they appeared upon the removal of the surface 8 inches of soil. This gives a better idea of their wide distribution on all sides of the plant. At this stage of development, the roots spread over three times as far as the vines. Clearly cultivation that extended beyond a depth of 1 inch would have been distinctly detrimental at this stage of development. Fig. 83.--Surface view of the widely spreading roots of cucumber on July 27, showing their appearance upon removal of the surface 8 inches of soil. Compare with Fig. 82. Maturing Plants.--A final examination was made Aug. 22 when many of the earliest fruits were fully grown and younger fruits and blossoms occurred in abundance. The spreading vines, some of which had four to six branches, measured 4 to 5.8 feet in length. The leaves, a few of which were beginning to dry, averaged 5.5 by 6 inches in size, some of the larger leaf blades being 9 inches long. Thus a very great photosynthetic area was exposed for transpiration. The taproots had not increased in depth and the deeper portions showed considerable deterioration. In fact most of the branches on the taproot below the 18-inch level were also withered. That some development had taken place here, however, since the last examination, was shown by the fact that a few roots had reached lengths of over 2 feet before decaying. But the main increase in absorbing surface had occurred in the formerly shallow portion. Some of these large laterals had increased their extent to a total distance of 7 feet where they ended in the surface foot of soil. Thus the roots kept pace with the spreading vines. The behavior of these laterals may be illustrated by a single, typical case. One branch left the taproot at a depth of 2.5 inches. It ran outward for 19 inches, where at a depth of 6 inches, it gave rise to a vertically descending branch which reached the 3-foot level. Two inches further on its course two more large, vertically descending branches arose. Both of these were traced to a depth of 40 inches. A few inches beyond the main root forked into two rather equal branches which continued their horizontal course and ended 50 and 52 inches, respectively, from the taproot. 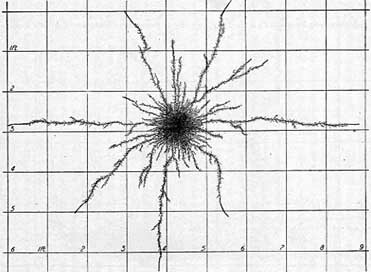 This root behavior gives the clue to a second way in which the absorbing area was increased, i.e., by the production of rather numerous, vertically descending and deeply penetrating branches. From 1 to 3 usually occurred on each of the 8 to 10 largest laterals. Some of the less extensive main branches also produced them. Moreover, not infrequently the main root itself turned downward, a behavior already indicated at the earlier examination. In this manner moisture and nutrients to depths of 3.7 feet were secured. Sometimes the deeply penetrating roots divided into several rather equal branches 3 to 4 inches long. These with their laterals formed an efficient absorbing network. All of the new roots were well branched; in fact over the entire root system branches were longer than before and laterals of the third and fourth order much more abundant. Intermingled with the main branches from the taproot were very numerous smaller ones, 12 to 26 in a single inch. These were most numerous just below the soil surface. Being profusely rebranched, they formed a close absorbing network. Summarizing, the taproot had grown somewhat since the July examination but was now considerably deteriorated. The surface-absorbing portion of the root system had extended its area from 3 or 4 feet (July 27) to 6 or 7 feet on all sides of the plant. Owing to longer and better-branched secondary laterals, the surface foot of soil was more thoroughly occupied. By the production of numerous, long, vertically penetrating branches reinforced by the downward penetration of some of the formerly horizontal roots, all of which were well clothed with absorbing rootlets, the second, third, and to some extent the fourth foot of soil were also ramified. In this way the absorbing area had kept pace with the vigorously growing tops. Summary.--The cucumber, upon germination, soon develops a strong taproot. This penetrates downward at the rate of 1 inch per day and extends into the third foot of soil. Numerous horizontal laterals develop rapidly and spread widely in the surface 8 inches. After 4 weeks some of these exceed the taproot in length. When the vines begin to run, the roots make a vigorous growth. Surface roots become extremely abundant. They quite fill the soil within a radius of 18 to 24 inches, the longer ones extending outward 3 to 4 feet. With their numerous branches they form the shallower portion of the root system. The rather poorly branched taproot, extending into the fourth foot of soil, represents the deeper part. The turning downward of some of the superficial roots or their branches foreshadows a rather marked, later, deeper rooting habit. Maturing plants, scarcely 10 weeks old, have vines 4 to 6 feet long and a surface root system quite as extensive, having a maximum spread of 7 feet. The main laterals are not only exceedingly numerous but profusely rebranched in such a manner as to thoroughly occupy the soil. The taproot has not increased in depth, and the deeper portion, which never becomes extensive, has more or less decayed. 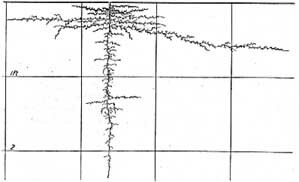 But the soil to a working depth of 3.7 feet is filled with an efficient absorbing system composed of the vertical ends of some of the surface branches or their well-branched, vertically descending laterals. This portion of the root system greatly extends the absorbing area and is an efficient protection against drought. Root System in Relation to Cultural Practice.--A study of the root system explains why the soil should be well drained but retentive of moisture. Light soils that warm quickly are favorable for rapid root and vine development but the late crop is likely to suffer from drought. It appears clear why on heavier soils the yields are usually larger and the bearing period longer. A compacting of a heavy clay during a wet. year, through the tramping incident to picking, is distinctly detrimental to the roots. This is reflected in poorer growth aboveground and in a decreased yield. The very rapid and extensive growth of the roots, largely in the surface layers of soil, indicates the need of favorable conditions in this portion of the substratum. This is accomplished by early plowing and thorough subsequent cultivation. Weeds are germinated and killed, water is conserved so that the seed will germinate even in dry weather, and the soil is brought into good physical condition. It remains loose and mellow and does not form a crust as is frequently the case when freshly plowed. Moreover, nutrients are made more readily available as a result of better aeration and the activities of nitrifying and other bacteria are promoted. In such a substratum the roots find conditions very favorable for growth. Poor soil preparation and low fertility result in slow development and the plants may be overtaken by drought before the root system has spread widely and deeply. The concentration of the root system largely in the surface soil layers also helps to make clear why a rich soil is essential to good yields. To get an earlier crop in the North and also to prolong the growing period, cucumbers often are started in the greenhouse or hotbed and transplanted into the field. The method employed results from the fact that all cucurbits are transplanted with difficulty if the root system is disturbed. This is due to certain root characters, such as early loss of absorbing power by the older roots and the slow rate of new root formation. To prevent disturbing the roots and thus checking the growth of the plants, the seeds are planted in soil that is well compacted into pots, plant bands, small boxes, etc., or transplanted from flats into these when the plants are very small. When they are set into the field, care is taken so that the whole mass of soil adheres to the roots and transplanting is accomplished without disturbing them. After the plants are transplanted, deep cultivation near them is desirable to loosen and to aerate the soil and thus to promote a rapid root growth. Plants started in the field should not be cultivated close to the hill since the root system, which spreads with great rapidity, is very likely to be injured. The common practice of frequent shallow cultivation until the vines cover the ground would seem to be quite in accord with the best root growth. But the cultivation must be very shallow, otherwise the long, horizontally spreading roots will be severed and the yield correspondingly reduced. It should be kept clearly in mind that the roots spread more widely than the vines, sometimes, as at the beginning of blossoming, three times as far. In fact the practice of shallow cultivation needs especial emphasis in the growing of all kinds of cucurbits. Experimental work along this line is needed. Since the hills are widely spaced, moisture may be conserved between them by proper tillage. By the time the vines have spread widely, however, the roots have similarly extended their territory. The vines prevent water loss from the surface soil by shading and the roots by vigorous absorption. Thus it would seem that if weeds were kept out, further cultivation would be unnecessary.